One must merely get out of the car to appreciate the treasure trove of possibilities Kansas has to offer. Savor the unspoiled skyscapes, landscapes, and wide-open spaces of the Sunflower State, from the picturesque sunsets to the nation’s largest remaining stand of tallgrass prairie to wildlife roaming their natural habitats. What’s more is the small town charm in Kansas, enchanting communities that offer entertaining events all year long. In addition to the scenic outdoors and charming towns, are the historic sites, landmarks, and museums – Kansas history is a huge part of American history. There’s no place like Kansas. Let us woo you – here are 10 reasons to fall in love with Kansas! The bright kaleidoscope of colors that meet the horizon make Kansas sunsets some of the most sought after sights. Perhaps one of the best places in Kansas for a view of the setting sun is the Flint Hills National Scenic Byway. Over thousands of years, geologic shifts have shaped the state’s diverse landscapes to create the scenic backdrop travelers see today. Possibly one of few states with such distinctive terrains, Kansas’ 12 byways provide incredible views of some of the last remaining unspoiled landscapes in America. Aptly named the Sunflower State, fields of sunflowers blooming in late summer make the perfect backdrop to any photo. One of the most renowned sunflower farms in Kansas is Grinter Farms in Lawrence. Small towns with lots of charm are a big part of Kansas. Unique destinations, with one-of-a-kind events, and local eateries make each one worth a stop – or two. 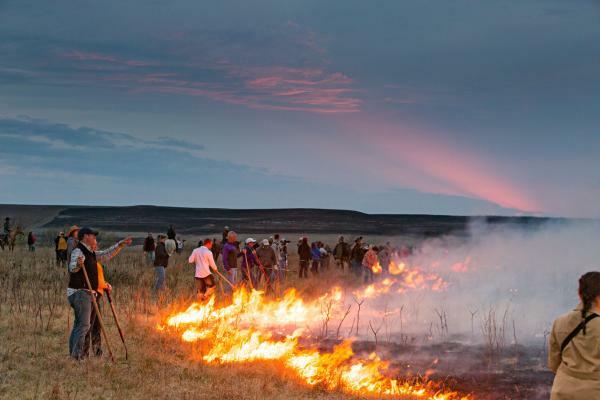 A regional art, prairie burns are a springtime ritual that is integral in sustaining rich grassland. Native Americans used burning to generate new plant growth that attracted bison. Flying W Ranch makes prairie burning a memorable Kansas experience. Kansas offers endless opportunities to view a variety of wildlife in their natural home. Discover one of the few places where buffalo still roam at Maxwell Wildlife Refuge. Kansas’ state parks have something for everyone. With more than 25 state parks set within various settings and diverse landscapes, park and nature enthusiasts will enjoy endless outdoor fun. Learn about famous Kansans, forts and trails, historic sites and museums to ethnic and cultural, walk, tour and discover the richness of Kansas history. It’s easy to find uninterrupted sky in Kansas – a stargazer’s destination. Perched high above the farmlands, Coronado Heights offers the best view of the stars in the Smoky Hills. From the tallgrass prairie to the high plains, or the wetland marshes and eastern wood hills, wide-open spaces stretch across Kansas in every direction.